Your Starter for Ten! 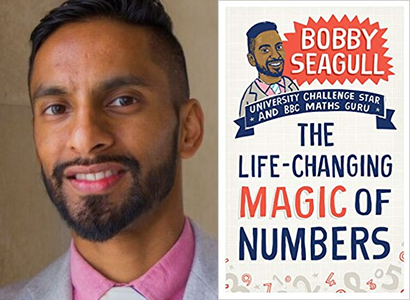 – change how you see the world around you and join us for an evening with University Challenge Star and BBC Maths Guru Bobby Seagull as he shows us the life changing magic of numbers. Once you know how to see them, numbers are all around us – buried in the dimensions of buildings and encoding the data on our favourite gadgets. They’re a beautiful system of patterns and codes, but also an essential tool that can guide our daily decisions, change our behaviour, and even predict the future-if we can just learn how to use them right. Long before his rise to cult fandom on University Challenge, Bobby Seagull was obsessed with numbers. They were the keys that unlocked of the randomness of football results, helped him organise his time, directed his social life and opened up the world of music. Told through stories from his life, Bobby illuminates the world of numbers and brings his infectious enthusiasm to everything from the mystery of magic numbers, the improbability of probability, the right number of friends to have, and how prime numbers control everything from credit card encryption to cicada hibernation habits. We look forward to welcoming Bobby to Oswestry for what should be a fun evening!